My second marathon focuses on some major Cult Movies that I've somehow missed over the years. Although I'm not a big fan of the term "cult movie", I do think these choices fit that description a lot better than most options, especially recent movies. I'm starting out with Alex Cox's Repo Man, which arrived in theaters back in 1984. Otto (Emilio Estevez) is an unremarkable punk kid who’s just quit his lame job at a grocery store. A chance encounter with Bud (Harry Dean Stanton) gets him employed as a repo man in a run-down area of Los Angeles. While learning the job, he keeps coming into contact with a fabled 1964 Chevy Malibu, which may have UFOs in its trunk. The government is also pursuing this car, and all types of mayhem ensue in this world of charming lunatics. 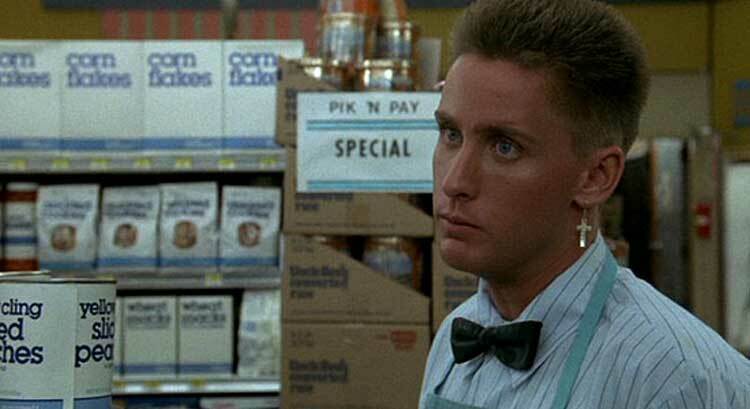 There’s very little about Repo Man that’s not unique, even if a few of the attempts fall short. This world doesn’t always make sense, but it’s never dull. The movie opens with a wonderfully awesome prologue where the trunk entity decimates a poor cop. A little bit later, Bud gives Otto a crash course in the code of the repo man, which includes never damaging cars and taking speed. The whole thing is so spot-on that even decent scenes without Bud miss his presence. Another memorable touch is the generic products with white labels and simple titles like “food” and “beer” in basic type. Also, this movie satirizes both the government spooks and the punks, who all look like giant phonies. Any film that can make pretty much everyone look stupid, even the lead character, has the chance to be great. I can’t even place this movie in a single genre, so it definitely steps outside the confines of any conventional framework. It includes elements of a sci-fi thriller, black comedy, government conspiracy, and punk-rock film (if that’s really a genre), but none of those labels really works for this movie. It’s also a fairly strong social satire, though the criticisms are never too blatant. The combination of all these parts is brilliant. Repo Man was writer/director Alex Cox’s first movie, which is surprising considering his confident style. It’s clear from the start that he’s in control of this world, which has all types of original touches. Even the second-tier repo men characters have clear personalities and don’t fall into a typical box. Cox’s next movie would be Sid and Nancy, but the rest of his career is all over the map. He even directed 2009’s Repo Chick, which obviously didn’t attract the same level of interest. The overall atmosphere is eerie, but not in a nightmare-inducing way. We never see the aliens, and even scenes that could be nasty are played for laughs. It’s obvious that Cox is having fun and there’s nothing sinister aimed at the audience. It's quite an original film and definitely worth seeing. Thanks! I definitely agree about Repo Man. I didn't have very high expectations, so it was a big surprise. It's easily one of my favorite discoveries so far with this blog.